As it turns out, I am not the only one writing on art and faith. Mark Driscoll, a pastor in Seattle, has written on Four Ways Artistry Can Become Idolatry. I deeply respect this man for his faithful preaching of God’s Word throughout his ministry, and I appreciate his in-your-face, take-no-prisoners style of teaching. Not everyone has the respect for him that I do, and people seem divided on whether or not Mark Driscoll is a good pastor or not. Even though I do not agree with everything he says, I am on the side that defends his ministry. Today, I want to discuss the article I’ve linked to above. If you haven’t read it, please stop, go click the link, and read the post. Then come back to join the conversation. Go ahead, I’ll wait. Now that you’re back, let’s dig through what Pastor Mark has to say about art and idolatry. Driscoll begins with a brief personal and church history as it regards art. The Catholic Church has always approved of and utilized art for the glorification of God. In the Middle Ages and through the Renaissance, the Church was one of, if not the biggest patron of the arts. Works such as Michelangelo’s ceiling of the Sistine Chapel have rarely found their match outside the world of the Church. There have been dark times (such as one pope removing all “indecent” parts of sculptures in the Vatican), but nothing compared to the iconoclasm associated with the Reformation. When the Protestants saw some church-goers worshipping the icons of the saints, they decided the best plan was to remove and destroy all art in their churches. Many pieces were smashed, burned, or torn to shreds to protect the laity from falling back into pagan-like worship. Mark Driscoll understands this. As an artist, I think it is a great shame. We are left without thousands of masterpieces, the spiritual work of artists trying to worship God through their talents. There had to have been a better way than to destroy everything that COULD have led a brother or sister to old and sinful ways. I totally agree. God is a Creator and gave us the commands to create beautiful works of art. We have a tendency, however, to worship that which we have created, including pieces originally intended for the glory of God. The point of icons, however, is not to be an object of worship, but as a means through which we are able to draw nearer to God. We are to look through the piece of art to the Creator who inspired it, and perhaps learn a little of His majesty, power, and beauty in the process. This is a matter of teaching this appreciation of icons to our congregations and helping them to not worship the object but the God it points to. I really think this is a misunderstanding of what an icon is. Nothing about the icon itself is more holy than anything else in creation. It is a tool, not to bring God closer to you, but to draw closer to Him. Just like a set of worship songs at the beginning of a service can help bring a congregation to an emotional place to hear the Word of God, so too can art allow us to place ourselves in a place to hear from our Creator. We must be careful, I admit, but I think all of our spiritual endeavors must be undertaken with a certain degree of caution. It is so easy to substitute the creation for the Creator, and vigilance is necessary. I don’t think I understand Driscoll’s argument on this one. As long as we do not worship the created portrayal of the Father, I don’t see this as idolatry. I agree that God the Father cannot be accurately portrayed, but part of the work of the artist is to explore the unportrayable. We often depict Death as a person, which is wildly inaccurate. I think it is perfectly acceptable for the artist, whether he or she works on the stage, in film, or on canvas to try to communicate his or her idea of who the Father is. I completely agree. There is only one Creator. Everything else is created. Nothing that I, or any other artist, can create will ever come close to the awesomeness of God. And we need to be very careful that we recognize this fact and keep it in our minds when we appreciate great art. 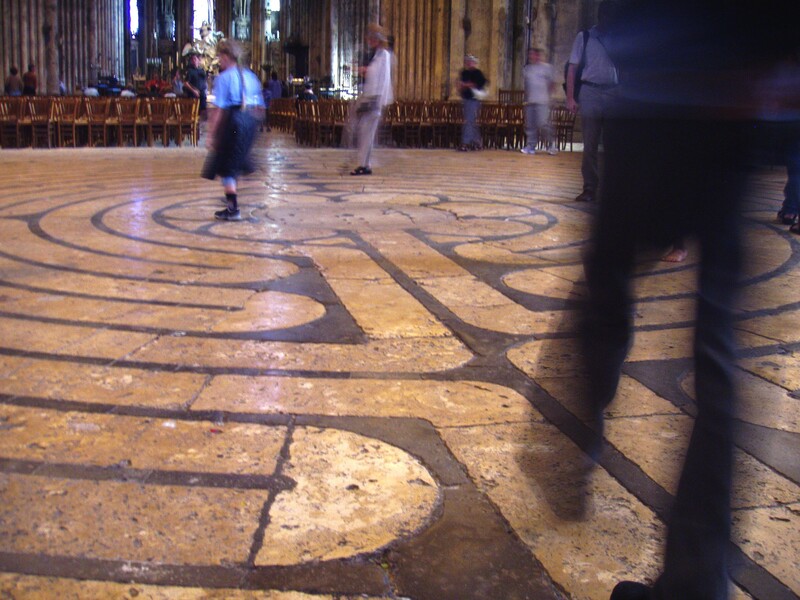 I don’t know, however, if Mark Driscoll really knows what Prayer Labyrinths are for. They, like art, are a tool to be used for contemplation. The end goal is not to turn completely inward, but to go on a spiritual journey. They were created as a substitute for pilgrimages for those unable to travel long distances. When properly used, they allow the believer to follow along a path that leads them through the prayers and thoughts of those who have come before. The aim is to draw nearer to God, not deeper into oneself. If it was, I could completely agree with Pastor Mark, but my understanding of this spiritual practice does not allow for that interpretation. While I agree that the creation of art should not replace the preaching of God’s Word in Sunday or Saturday worship services, there are other ways to gather and worship God. Perhaps artists come together on a Thursday night to draw or paint together for God’s glory. I would probably include some Bible reading during this event, but would usually forgo formal preaching. “I am for artistry when it is subservient and obedient to God’s Word.” As a faithful artist, I couldn’t agree more. My art is not my God, it is one of my paths to glorify Him. I love Pastor Mark’s preaching and respect what he has to say. I hope this post has allowed another voice to enter the discussion. Now, I would love to know what you think about Driscoll’s four points above. Where is the line between art and idolatry? How do we honour God with our calling while maintaining a safe distance from worshipping the created thing? Please chime in! The Holy Trinity to work with us on tearing those walls down! But art gets us looking at things from unexpected angles which brings new light on them AND art allows us to approch subjects that would otherwise seem taboo. … Did I mention, I love art? Thanks so much! Your words are very encouraging. You insight on art confronting the emotional walls is great! Art can be a fantastic tool to help us along our spiritual journeys, one which should not be ignored by people of any faith. I am overjoyed that you love art, and am glad to have you along on this journey!